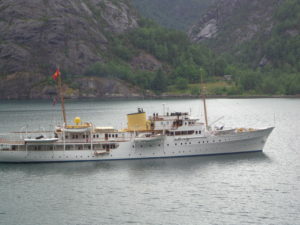 12 July – we arrive in Travemunde at around 9pm after about 30 hours on a very calm ferry crossing from Helsinki (about 1150 km). 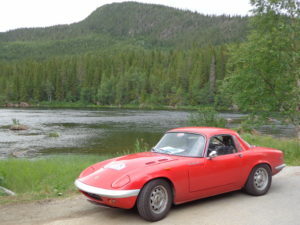 Yesterday was the 300 mile drive to Helsinki, which started on glorious roads – wit no speed cameras! We had some confusion as Allison was adamant that we should be on road number 89 when in fact we were on the 68. Changing the direction of the map made life a little clearer! 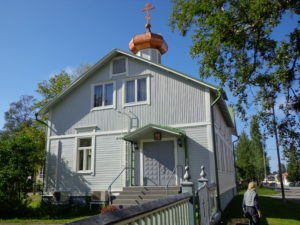 Sue and Will did a grand tour of Helsinki Old Town before arriving at the port 15 minutes after check in closed. My first task at the hotel was to change the points – they had been ok but this was a precaution against a breakdown (and losing time) at the side of a German autobahn. Probably a good thing as the set that came out looked pitted with limited life expectancy. 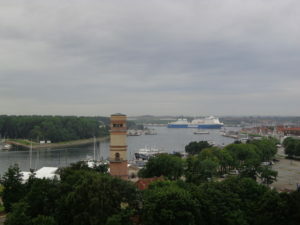 Now 7.00 am local time on 13 July and our incoming ferry has just turned around in the narrow river to start its return to Helsinki. 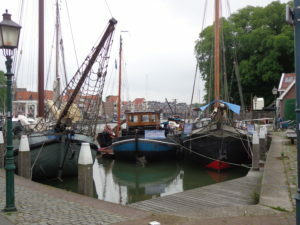 We hope to be on this evening’s boat to Harwich – and more car repairs to look forward to! in the Crimean war in 1854 when the English attacked Finland (yes Finland is a long way from the Crimea but Finland was then part of Russia). 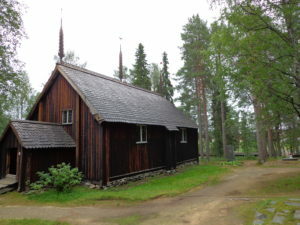 17th Century wooden Church – somehow it escaped the scorched earth policy at the end of WW2. We stopped to refuel and there in the café was the friendly man from Ostend with whom I had put the world to rights whilst waiting for the lorry to be pulled out of the ditch yesterday. Don’t get lost at Santa’s village! 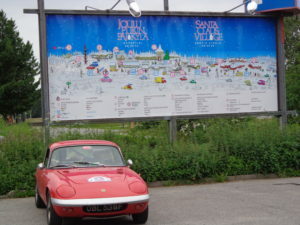 Santa village which has been constructed around it – yes you can have 365 days a year Santa – whoopee! This had to be followed by culture at the Arktikum – a museum of the Arctic and the Sami people. Then to the hotel – Allison found she had lost her handbag (cards, passports, phones, money, house keys – nothing of importance!) By the time we had got back to the Arktikum no sign, gone! 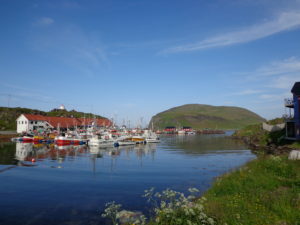 The hotel receptionist was very helpful and phoned around – yes a bag had been handed in but no details would be given. She drew us a map and we ran off; the building was closed, no-one there. I ran back to the hotel – oops, wrong building, try this instead! A policeman let us in, thankfully everything was there – a big thank you to the honest citizen of Rovaniemi! She had put it on the roof when getting into the car – and left it there when I drove off. 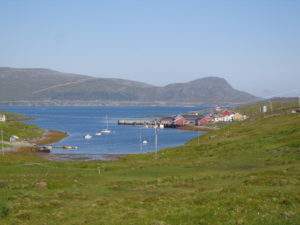 8 July – a fairly short day (150 miles) to Karasjok, close to the Finnish border. 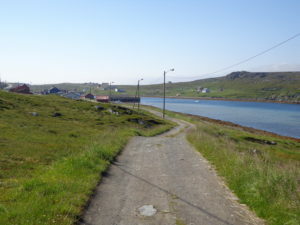 We left early and made good progress on empty roads – where have all the RVs and bikes gone? This stopped suddenly when we found a Highways van parked across the road. 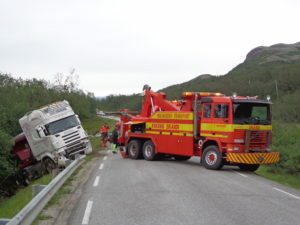 A lorry ha gone off the road and into a ditch, two tow trucks were on hand to pull him out. After about an hour and a half it was winched up and onto the road. 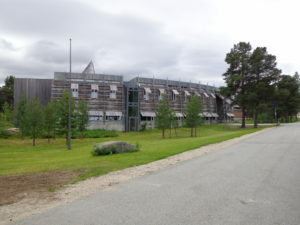 We were in a hurry as our guide book said there were guided tours of the Sami parliament at 1pm and Allison particularly wanted to go. We got there with 20 minutes to spare – and found out that tours were every hour on the half hour! More culture followed at the local museum followed by a tourist trap at the Sapmi Culture park. The Sami are the indigenous people – historically semi nomadic reindeer herdsmen and now spread across Norway, Sweden, Finland and Russia. 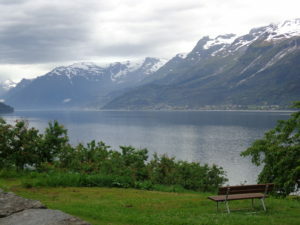 6 July – it was almost dry as we left Alta but then turned to wet with low cloud so some very slow driving on nearly empty roads. 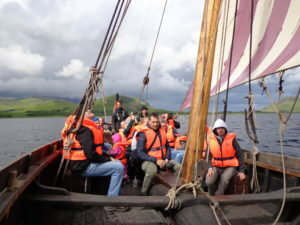 As we went further north over the hills, the sun emerged and burnt away the cloud – great! 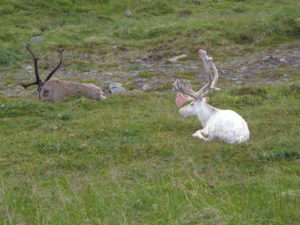 We stopped at a silversmith in the middle of nowhere – and were given some reindeer horns for the dogs to chew. Repvag – street lights on this track? 5 July – a long day with rain, wet and chilly! 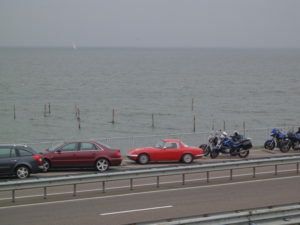 Speed cameras, cloud, road-works and very little sight-seeing. We left Narvic after looking at the steering, deciding it was not good but equally there was nothing to be done about it here. Arrived in Alta and decided it was much the same. 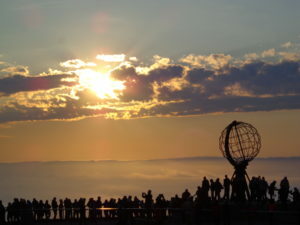 Tomorrow we should get to the destination – North Cape. 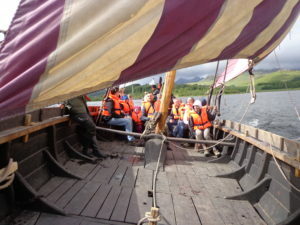 is all in front of the mast so if they want to change tack, instead of the sail and boom flying across the cabin, they release one bottom corner of the sail, pull in the other side – job done! We left at around 2.30 with a little over 4 hours driving ahead of us – times dependent on how quickly you could overtake the queues of RV’s – get a close convoy and you’re lost! Almost immediately the engine coughed and spluttered – you hope its something simple but experience and your inner self tells you its – points. Glide to a stop in a convenient bus stop, triangle out, boiler suit on; there is a quick way to do this if you have all the right tools and lighting and you’re in the workshop. But when you’re at the side of the road, the only way is distributor out and hope you can get it back in the same place and keep the ignition timing – and it worked! Engine purred at the first ask and we flew! Now the problem at these speeds was the car’s desire to bounce around the road on the bumpy surface. At the hotel car park – problem diagnosed – there is play in the steering rack, can’t fix it here; have to drive more cautiously – oh shame! 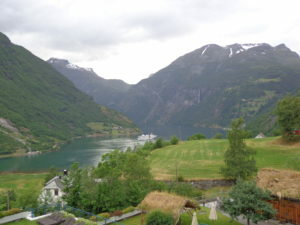 2 July – today was going to be a long day with 300 miles to do and speed limits of c 80kph (50 mph) – and Norwegian speeding penalties are severe (so we have been told). Leaving the hotel car park, the speedo needle fluctuated wildly between 20 and 60 and settled on 0 for the rest of the day. No speedo, no odometer and the fuel gauge reads either full or empty. Fortunately the trip meter does work and tells us distance and speed. The day started warm and dry – the inevitable rain came later! We headed north on the E6 with a change of landscape to a more wooded feel. 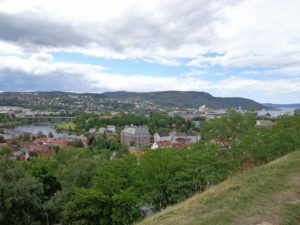 1 July – a rest day in Trondheim. 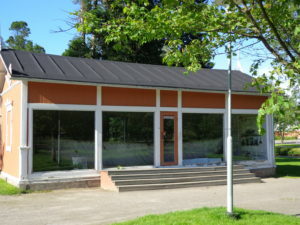 winner of numerous awards for its design. sadly it was raining! 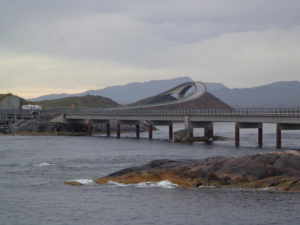 This bridge is perhaps the most photographed feature. 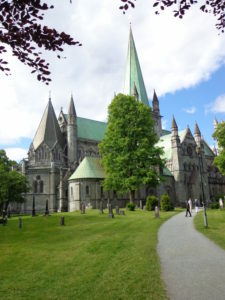 Then on to Kvernes to see another Stave Church – we got to the outside but they had a series of tour busses from the cruise liners booked in for guided tours so our visit was very brief – we continued to Kristiansund. 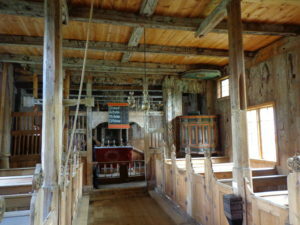 The Codfish museum was much quieter and surprisingly interesting! 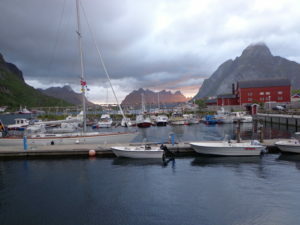 Then on to our overnight stop in Trondheim where we have a rest day, waiting for the tour’s second car to arrive from Oslo.
. Now in Molde, an industrial town and the end of the Fjord section of the journey – and the German tour group have rolled into town; they now head south whilst we head for island-hopping Atlantic Road and the north, via Trondheim where we expect to be joined by the second car in our tour. 28 June – a rest day but that is not what Allison thinks about her knees. 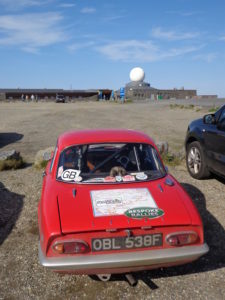 The German tour group was leaving as we checked fluid levels, tightened the handbrake and set the electric fans to permanent “on” in preparation for the two climbs tomorrow. 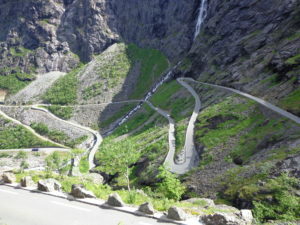 27 June – the Flam railway. This 20 km section of railway rises nearly 900 metres and lasts about an hour. 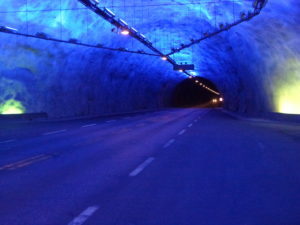 It twists and turns through some 20 tunnels to link Flam on the Aurlandsfjord with the main Bergen to Oslo line. slightly surreal with a ghostly blue lighting above and yellow lighting at ground level. 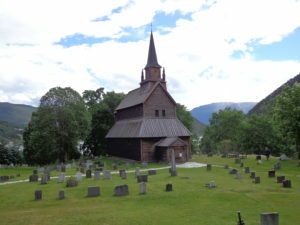 Stave Churches are wooden Churches from c. 1150, there were thousands but now only 29 remain. 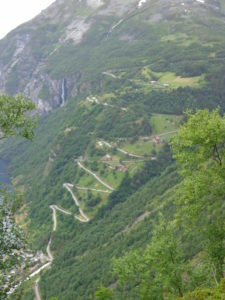 After the Churches it was the 1434metre high Sognefjellet mountain pass (said to be the highest in Northern Europe). At the top they were cross country skiing but getting up there proved to be hot work for the Lotus and we had to stop when the temperature gauge got to 100C. Not sure those electric fans are cutting in properly! 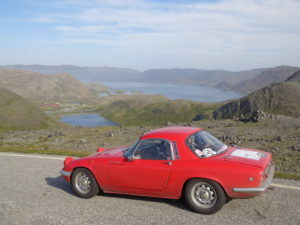 This was followed by the fastest section of road driving we have yet encountered in Norway – parts of the route have a speed limit of 90 kph but I could not possibly recall what speed the speedo showed! 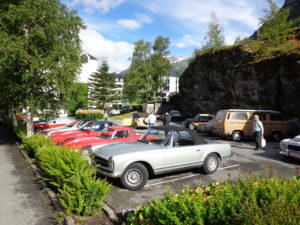 Arriving at our hotel in Geiranger the car park was reserved – for a German Classic car tour! 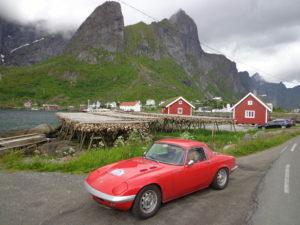 We joined them, adding a touch of Lotus class – how is it that a German tour group can muster 40+ cars but our UK group was only 2 and the second has yet to arrive? 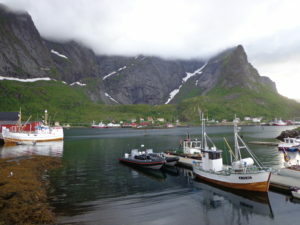 26 June it was still raining when we disembarked at Stavanger. 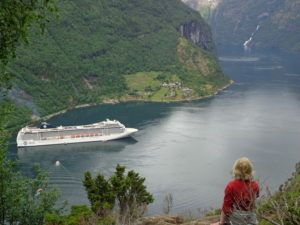 About 30 km later and we queued for another ferry on the island-hopping coast road to Bergen. This was Fjordland, where the roads hug the shore line and waterfalls cascade down the steep slopes on both sides. 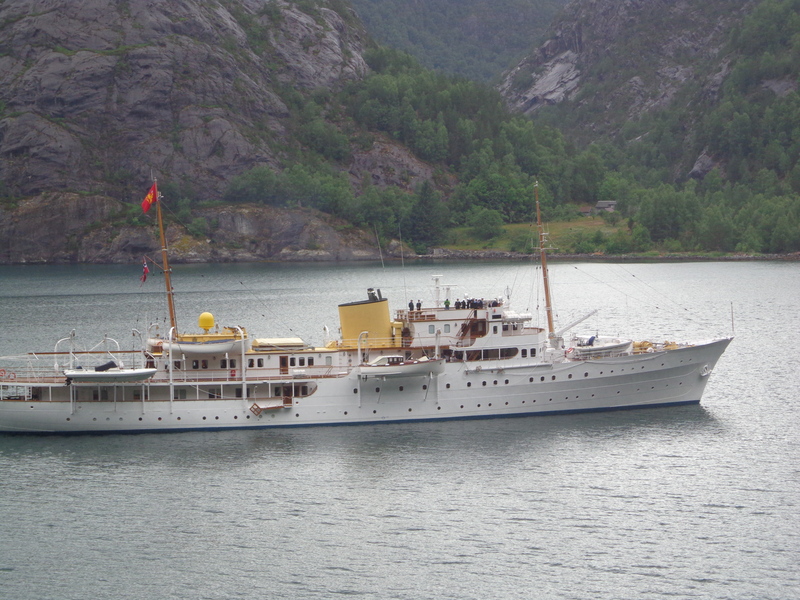 We stopped at Langfoss waterfall (conveniently located opposite a lay-by on the main road) and we handed some Norwegian flags by a very excited kiosk owner – the Royal Yacht with King and Queen aboard was due to pass by at any moment. We could be honorary Norwegians and wave enthusiastically! Our next stop was not so simple. There was a noise and feel of a puncture but no flat tyres; one wheel had come loose and was wobbling on the hub. This was annoying as it damages the locating holes on the rim and may be another write-off – and they aren’t made any more. 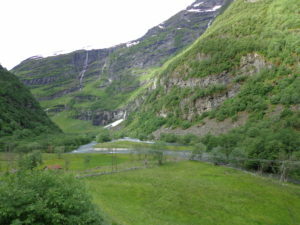 Another waterfall at Tvindefoss was said to be one of Norway’s most popular sites (it is believed to enhance sexual potency). The continuous rain put a damper on that and it was nearly deserted! 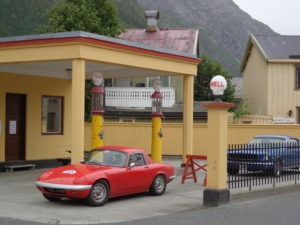 We carried on to our overnight stop at Flam – home of the Flam Railway. 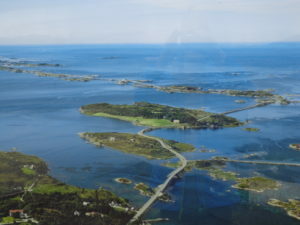 25 June and a leisurely drive to Hirtsals in Northern Denmark with a visit to Aalborg thrown in – hmm it didn’t quite work out like that! Getting out of Hamburg went ok but it was raining and it rained all morning until we got to Denmark. The two lane motorway north was full of cars and water and roadworks – and we crawled. We had to stop at one stage in an emergency pull-in when the wiper rubber tried to fly off the blade – that was fixed by that invaluable invention – a cable tie. 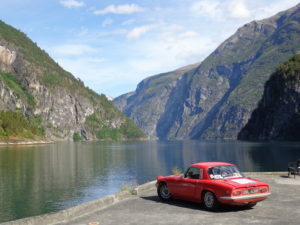 We crawled into Denmark as the Security Services glanced at but didn’t check every vehicle. Aalborg was a might have been and we reached the ferry terminal about half an hour before check in. 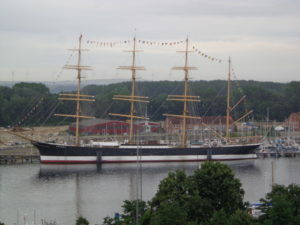 24 June – now in Hamburg after some unwanted excitement en route. 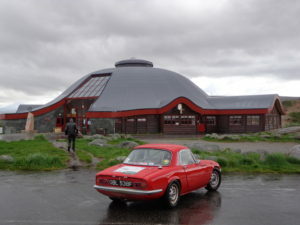 The car went to the rolling road on Tuesday morning to sort out a lack of performance and low speed power. I went to collect it on Wednesday afternoon – and drove for about a mile before it died – completely, dead. A tow truck took me back to the engine tuner. Points. 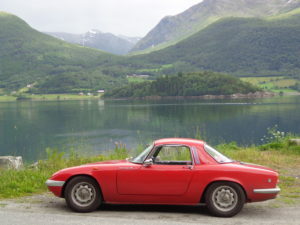 No surprise, the car has always eaten points and this was solved by the Boyer Bransden ignition pack – but that was for positive earth. After the Amazon, I installed an alternator, which is negative earth and after checking all the wiring I hoped not to need this protection – wrong, obviously! How long will these points last now? Thursday and last minute checks – radiator level low – where has the water gone? I started the engine, stopped it and saw a dribble round the thermostat housing. A new gasket was not the answer but a new gasket plus some sealer did the trick. Then off to Harwich – and the temperature gauge just carried on getting higher – the fans were ok but not switching on; I tweaked the temperature control and they woke up. 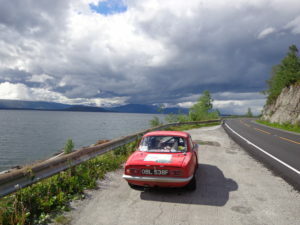 This entry was posted on June 15, 2016, 4:02 pm and is filed under Patagonia Rally 2010. You can follow any responses to this entry through RSS 2.0. Both comments and pings are currently closed.